For other uses, see Groundhog (disambiguation) and Woodchuck (disambiguation). The groundhog is the largest sciurid in its geographical range. Adults are 16 to 20 inches (40–50 cm) long, including a six-inch (15 cm) tail. A large woodchuck thought to weigh twenty pounds when carried was exactly half that weight when weighed by scale. Woodchuck weight ranges from five to twelve pounds. Extremely large individuals may weigh up to 15 pounds. Seasonal weight changes indicate circannual deposition and use of fat. Groundhogs attain progressivly higher weights each year for the first two or three years, after which weight plateaus. Groundhogs have four incisor teeth which grow ​1⁄16″ (1.5 mm) per week. Constant usage wears them down again by about that much each week. Unlike the incisors of many other rodents, the incisors of groundhogs are white to ivory-white. Groundhogs are well-adapted for digging, with short, powerful limbs and curved, thick claws. Unlike other sciurids, the groundhog's tail is comparably shorter—only about one-fourth of body length. The groundhog prefers open country and the edges of woodland, and is rarely far from a burrow entrance. Marmota monax has a wide geographic range. It is typically found in low-elevation forests, small woodlots, fields, pastures and hedgerows. It constructs dens in well-drained soil, and most have summer and winter dens. Human activity has increased food access and abundance allowing M. monax to thrive. In the wild, groundhogs can live up to six years with two or three being average. In captivity, groundhogs reportedly live up to 14 years. Humans, dogs, coyotes, and foxes are about the only predators that can kill adult groundhogs although young may also be taken by owls and hawks. The red fox is the major predator of Marmota monax. Occasionally woodchucks may suffer from parasitism and a woodchuck may die from infestation or from bacteria transmitted by vectors. In areas of intensive agriculture and dairying regions of the state of Wisconsin, particularly the southern parts, the woodchuck by 1950 had been almost extirpated. :124 Jackson (1961) suggested the amount of damage done by the woodchuck had been exaggerated and that excessive persecution by people substantially reduced its numbers in Wisconsin. In some areas marmots are important game animals and are killed regularly for sport, food, or fur. In Kentucky an estimated 267,500 M. monax were taken annually from 1964 to 1971 (Barbour and Davis 1974) Woodchucks had protected status in the state of Wisconsin until 2017. Woodchuck numbers appear to have decreased in Illinois. The time spent observing groundhogs by field biologists represents only a small fraction of time devoted to the field research. W.J. Schoonmaker reports that groundhogs may hide when they see, smell or hear the observer. :41–43 Ken Armitage, marmot researcher, states that the social biology of the groundhog is well understudied. Despite their heavy-bodied appearance, groundhogs are accomplished swimmers and occasionally climb trees when escaping predators or when they want to survey their surroundings. They prefer to retreat to their burrows when threatened; if the burrow is invaded, the groundhog tenaciously defends itself with its two large incisors and front claws. Groundhogs are generally agonistic and territorial among their own species, and may skirmish to establish dominance. Outside their burrow, individuals are alert when not actively feeding. It is common to see one or more nearly-motionless individuals standing erect on their hind feet watching for danger. When alarmed, they use a high-pitched whistle to warn the rest of the colony, hence the name "whistle-pig". Groundhogs may squeal when fighting, seriously injured, or caught by a predator. Other sounds groundhogs may make are low barks and a sound produced by grinding their teeth. David P. Barash wrote he witnessed only two occasions of upright play-fighting among woodchucks and that the upright posture of play-fighting involves sustained physical contact between individuals and may require a degree of social tolerance virtually unknown in M. monax. He said it was possible to conclude, alternatively, that upright play-fighting is part of the woodchuck's behavioral repertory but rarely shown because of physical spacing and/or low social tolerance. Mostly herbivorous, groundhogs eat primarily wild grasses and other vegetation, including berries and agricultural crops, when available. In early spring, dandelion and coltsfoot are important groundhog food items. Some additional foods include sheep sorrel, timothy-grass, buttercup, tearthumb, agrimony, red and black raspberries, buckwheat, plantain, wild lettuce, all varieties of clover, and alfalfa. Groundhogs also occasionally eat grubs, grasshoppers, insects, snails and other small animals, but are not as omnivorous as many other Sciuridae. Groundhogs will occasionally eat baby birds they come upon by accident. An adult groundhog will eat more than a pound of vegetation daily. In early June, woodchucks' metabolism slows, food intake decreases, their weight increases by as much as 100% as they produce fat deposits to sustain them during hibernation and late winter. Instead of storing food, groundhogs stuff themselves to survive the winter without eating. Thought not to drink water, groundhogs are reported to obtain needed liquids from the juices of food-plants, aided by their sprinkling with rain or dew. Groundhogs are excellent burrowers, using burrows for sleeping, rearing young, and hibernating. W. J. Schoonmaker excavated 11 dens finding the earth removed from these averaged six cubic feet or four and eight-tenths bushels per den. The longest burrow was 24 feet plus 2 short side galleries. The amount of soil taken from this den was eight bushels and it weighed 640 pounds. The average weight of the earth taken from all eleven dens was 384 pounds. Though groundhogs are the most solitary of the marmots, several individuals may occupy the same burrow. Groundhog burrows usually have two to five entrances, providing groundhogs their primary means of escape from predators. Burrows are particularly large, with up to 14 metres (46 ft) of tunnels buried up to 1.5 metres (5 ft) underground, and can pose a serious threat to agricultural and residential development by damaging farm machinery and even undermining building foundations. In a June 7, 2009 Humane Society of the United States article, "How to Humanely Chuck a Woodchuck Out of Your Yard", John Griffin, director of Humane Wildlife Services, stated you would have to have a lot of woodchucks working over a lot of years to create tunnel systems that would pose any risk to a structure. The burrow is used for safety, retreat in bad weather, hibernating, sleeping, love nest, and nursery. In addition to the nest, there is an excrement chamber. The nest chamber may be about twenty inches to three feet below ground surface. It is about sixteen inches wide and fourteen inches high. There are typically two burrow openings or holes. One is the main entrance, the other a spy hole. Description of the length of the burrow often includes side galleries. Excluding side galleries, Schoonmaker reports the longest was twenty-four feet, and the average length of eleven dens was fourteen feet. W. H. Fisher investigated nine burrows, finding the deepest point forty-nine inches down. The longest, including side galleries, was forty-seven feet, eleven and one half inches. Numbers of burrows per individual groundhog decreases with urbanization. Bachman mentioned that when the young groundhogs are a few months old, they prepare for separation, digging a number of holes in the area of their early home. Some of these holes were only a few feet deep and never occupied but the numerous burrows gave the impression that groundhogs live in communities. Groundhogs are one of the few species that enter into true hibernation, and often build a separate "winter burrow" for this purpose. This burrow is usually in a wooded or brushy area and is dug below the frost line and remains at a stable temperature well above freezing during the winter months. In most areas, groundhogs hibernate from October to March or April, but in more temperate areas, they may hibernate as little as three months. Groundhogs hibernate longer in northern latitudes than southern latitudes. To survive the winter, they are at their maximum weight shortly before entering hibernation. When the groundhog enters hibernation, there is a drop in body temperature to as low as 35 degrees fahrenheit, heart rate falls to 4–10 beats per minute and breathing rate falls to one breath every six minutes. During hibernation, they experience periods of torpor and arousal. Hibernating woodchucks lose as much as half their body weight by February. They emerge from hibernation with some remaining body fat to live on until the warmer spring weather produces abundant plant materials for food. Males emerge from hibernation before females. Groundhogs are mostly diurnal, and are often active early in the morning or late afternoon. Usually groundhogs breed in their second year, but a small proportion may breed in their first. The breeding season extends from early March to mid- or late April, after hibernation. A mated pair remains in the same den throughout the 31- to 32-day gestation period. As birth of the young approaches in April or May, the male leaves the den. One litter is produced annually, usually containing two to six blind, hairless and helpless young. Groundhog mothers introduce their young to the wild once their fur is grown in and they can see. At this time, if at all, the father groundhog comes back to the family. :316 By the end of August, the family breaks up; or at least, the larger number scatter, to burrow on their own. Both their diet and habit of burrowing make them serious nuisance animals around farms and gardens. They will eat many commonly grown vegetables, and their burrows can destroy farm ponds and undermine foundations. Consequently, there is a thriving business exterminating them. Their preferred habitat of grassy areas near woods also makes them abundant along roads and highways where they often become the victims of passing cars. 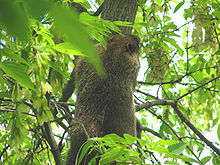 Very often the dens of groundhogs provide homes for other animals including skunks, red foxes, and cottontail rabbits. The fox and skunk feed upon field mice, grasshoppers, beetles and other creatures that destroy farm crops. In aiding these animals, the groundhog indirectly helps the farmer. In addition to providing homes for itself and other animals, the groundhog aids in soil improvement by bringing subsoil to the surface. The groundhog is also a valuable game animal and is considered a difficult sport when hunted in a fair manner. In some parts of Appalachia, they are eaten. The committee concludes that "a small bounty will prove of incalculable good; at all events, even as an experiment, it is certainly worth trying; therefore your committee would respectfully recommend that the accompanying bill be passed." Groundhogs may be raised in captivity, but their aggressive nature can pose problems. Doug Schwartz, a zookeeper and groundhog trainer at the Staten Island Zoo, has been quoted as saying "They’re known for their aggression, so you’re starting from a hard place. His natural impulse is to kill ’em all and let God sort ’em out. You have to work to produce the sweet and cuddly." Wildlife rehabilitation is the treatment and care of injured, orphaned, or sick wild animals so that they can be released back to the wild. In the event an injured, orphaned, or sick groundhog is found, contact a wildlife rescue center or rehabilitator. Groundhogs cared for by a rehabilitator that survive but can't be returned to the wild may remain with their caregivers and become educational ambassadors. In the United States and Canada, the yearly February 2 Groundhog Day celebration has given the groundhog recognition and popularity. The most popularly known of these groundhogs are Punxsutawney Phil, Wiarton Willie, Jimmy the Groundhog, Dunkirk Dave, and Staten Island Chuck kept as part of Groundhog Day festivities in Punxsutawney, Pennsylvania;, Wiarton, Ontario; Sun Prairie, Wisconsin, Dunkirk, New York, and Staten Island respectively. The 1993 comedy film Groundhog Day references several events related to Groundhog Day, and portrays both Punxsutawney Phil himself, and the annual Groundhog Day ceremony. Famous Southern groundhogs include General Beauregard Lee, based at the Yellow River Game Ranch outside Atlanta, Georgia. 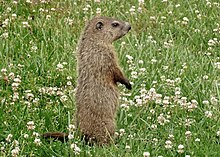 Groundhog burrows have revealed at least one archaeological site, the Ufferman Site in the U.S. state of Ohio. Archaeologists have never excavated the Ufferman Site, but the activities of local groundhogs have revealed numerous artifacts. They favor the loose soil of the esker at the site lies, and their burrow digging has brought many objects to the surface: human and animal bones, pottery, and bits of stone. Woodchuck remains were found in the Indian mounds at Aztalan, Jefferson County, Wisconsin. Robert Frost's poem "A Drumlin Woodchuck" uses the imagery of a groundhog dug into a small ridge as a metaphor for his emotional reticence. ^ Linzey, A. V.; Hammerson, G. (NatureServe) & Cannings, S. (NatureServe) (2008). "Marmota monax". IUCN Red List of Threatened Species. Version 2014.3. International Union for Conservation of Nature. Retrieved 7 January 2015. ^ Thorington, R.W., Jr.; Hoffman, R.S. (2005). "Family Sciuridae". In Wilson, D.E. ; Reeder, D.M (eds.). Mammal Species of the World: A Taxonomic and Geographic Reference (3rd ed.). Johns Hopkins University Press. p. 802. ISBN 978-0-8018-8221-0. OCLC 62265494. ^ Linné, Carl von (1758). Systema naturae per regna tria naturae. 1 (10 ed.). p. 60 – via Biodiversity Heritage Library. ^ "Marmota monax". North American Mammals. Smithsonian Institution. Retrieved 1 February 2015. ^ Chamberlain, Alexander F. (22 November 2018). "Algonkian Words in American English: A Study in the Contact of the White Man and the Indian". The Journal of American Folklore. 15 (59): 240–267. doi:10.2307/533199. JSTOR 533199. ^ a b Schoonmaker, W.J. (1966). The World of the Woodchuck. J.B. Lippincott. ISBN 978-1135544836. ^ Marmota monax: Woodchuck. animaldiversity.com. Retrieved on 2015-02-24. ^ Lyrics and Words for Children's Nursery Rhymes and Songs. BusSongs.com. Retrieved on 2011-09-15. ^ Grizzell, Roy A. (April 1955). "A Study of the Southern Woodchuck, Marmota monax monax". American Midland Naturalist. 53 (2): 257. doi:10.2307/2422068. JSTOR 2422068. ^ "Marmota monax (woodchuck)". Animal Diversity Web. ^ Jackson, Hartley H T (1961). Mammals of Wisconsin. University of Wisconsin Press. ^ "Wisconsin's endangered and threatened species laws". Wisconsin Department of Natural Resources. Retrieved 25 April 2018. ^ Barash, David (1989) Marmots, Social Behavior and Biology. Stanford University Press. Preface p. xv. ISBN 0804715343. ^ Special feature "The Study of Groundhogs: A Real Life Look at Marmots", Movie "Groundhog Day" 15th Anniversary Edition. ^ Chapman, J. A.; Feldhammer, G. A. (1982). 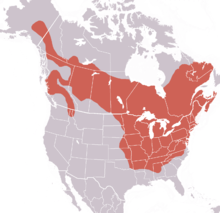 Wild Mammals of North America, Biology, Management, Economics. Johns Hopkins University Press. ISBN 0801823536. ^ a b Whitaker, John O; Hamilton, W J. (1998). Mammals of the Eastern United States. Cornell University Press. ISBN 0-8014-3475-0. ^ a b Light, Jessica E. "Animal Diversity Web: Marmota monax". University of Michigan Museum of Zoology. Retrieved 2009-07-14. ^ a b c Hinterland Who's Who ("Canadian Wildlife Service: Mammals: Woodchuck"). Hww.ca. Retrieved on 2011-09-15. ^ Marmots, Social Behavior and Biology, 1989, David P. Barash, Stanford University Press, p. 97. ^ Woodchucks in Rhode Island Archived 2007-04-12 at the Wayback Machine. (PDF) dem.ri.gov. Retrieved on 2011-09-15. ^ Woodchuck. Marmota monax. (PDF). North Caroline Wildlife. ^ Seton, Ernest Thompson, Lives of Game Animals, Volume IV. Doubleday, Doran & Company. ^ Castro, Everett J. (January 1984). "Celebrate Groundhog Day With Groundhog Recipes". Mother Earth News. ^ Newman, Andy (2007-12-01). "Grooming a Weatherman for his TV Debut, and Hoping He Doesn't Bite The Host". The New York Times. ^ Penn State News, (January 29, 2009) "Professor studies groundhog hibernation to benefit mankind"
^ a b Owen, Lorrie K. (ed.) (1999). Dictionary of Ohio Historic Places. Vol. 1. St. Clair Shores: Somerset, p. 328. ^ Oehlschlaeger, Fritz (December 1982). "Two Woodchucks, or Frost and Thoreau on the Art of the Burrow". Colby Quarterly. 18 (4): 214–219. Retrieved 1 April 2019. Wikimedia Commons has media related to Marmota monax. This page was last edited on 1 April 2019, at 05:40 (UTC).